If you live in Orange County, I will provide a list of interesting excursions, including restaurants, to enjoy visiting the county where you can find Disneyland. Estancia Park, Costa Mesa -- oldest home in Orange County settled by Spanish. Goathill Junction - Costa Mesa - model railroaders have created a small public railroad for entertainment. Only on 3d Saturday & Sunday of each month. Aliso Viejo's Canyon View Park with an ocean view- here is club discussion. If you are coming from I-5, it’s a bit of a drive to get to Canyon View. Exit at Oso Parkway and turn toward Aliso Viejo. Oso turns into Pacific Park as you cross La Paz. It’s probably a 10 minute drive up Oso/Pacific Park until you make a left onto Canyon Vistas (past Wood Canyon). 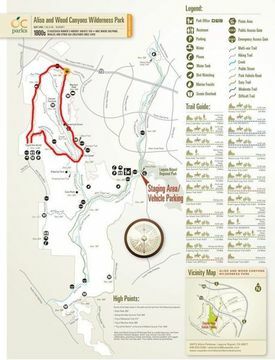 The park is located at the bottom of Canyon Vistas on the left hand side. Parking is available on the street. If you are coming from afar, the 73 Tollroad is a more convenient option. You’d just take the Pacific Park exit and turn right onto Canyon Vistas. There is a $3 parking fee for the day. Here is a screen link of the Aliso & Wood Canyon's Wilderness park on a webpage OC provides -- the Green tree symbol standing for the park. Technically, this is a hotel with a Laguna Vibe that is opening in late 2015, so I don't know if it is accesible right now. 28241 La Paz, Laguna Niguel. It has a lake with boats for rent, and you can fish. It has a $5 entrance fee. The boat rental is $15 p/h (or day?, not recall), and $10 for day to rent a trout rod; $28 for fishing permit if you don't already have one; and miscellaneous charges for bait and tackle gear including net. You can only take away trout. It is restocked weekly with 2500 lbs of trout. There are many other fish in pond which you must release. 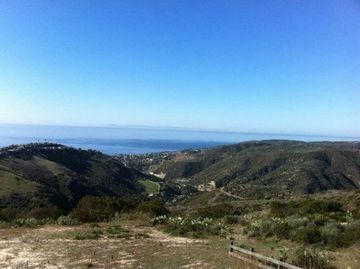 This is a park with an amazing vista -- 180 degreesof Laguna on one side, and 180 degrees on the other of the El Toro valley. Here is a link to google maps. Below to the right is hiking / running trail when you cross the soccer field. There is also tennis here that you put in a few quarters to play for a while. Also, there are 2 basketball courts. Also, for toddlers a friendly set of jungle gymns. This is a perfect park in the perfect place with perfect views. For GPS users - crucial to find your way down this small mountain, the address I use to find Moulton park is 1005 Balboa Ave Laguna Beach, CA 92651. Please do not bother these people. Their house is directly across from Moulton Meadows park. San Clemente Beach Park -- official website. Has a hiking trail. San Clemente - this is known as the Spanish Village ... founded in 1925, and inspired by Santa Barbara. You can walk or run along the railway tracks that follow the ocean. The pier has beautiful sites to see. For a healthy restaurant with great shakes and main courses, go to Active Culture restaurant, at 111 S El Camino Real, San Clemente, CA 92672. You can see its menu at this link. Free online from UC books is Gerald Kuhn's book Sea Cliffs, Beaches, and Coastal Valleys of San Diego County (U. Cal. Press, 1984) - with color pictures and all.